The term high-end has been used in the home audio market for many years now. High-end home audio is what we refer to when we speak of a higher level of fidelity in a home stereo system. Classic circuit design, vacuum tube technology and scientifically engineered, proprietary components are carefully selected and combined to provide an extraordinary listening experience for those who are fortunate enough to hear it. George Alessandro has taken this concept and applied it to the world of guitar amplification, with extraordinary results. Beginning with his Redbone and Bloodhound series of heads, George has developed a circuit which is elegant in its simplicity, and which, when combined with carefully selected, ultra-premium components, provides a harmonically rich sonic experience found in no other amplifier currently available. Other models in the lineup, such as the Beagle, the Basset Hound, the English Coonhound, the Plott Hound, the Italian, the Black ‘n Tan, and the Blue Tick carry the concept even further. Alessandro amps are not for everyone. But for those whose taste is discerning and refined, we believe there to be no finer amplifier available anywhere, at any price. Are you looking for a Straight Ahead Jazz Amp? The Italian Greyhound was designed to deliver an amplified, acoustic Archtop sound. The Italian is available with or without Reverb. 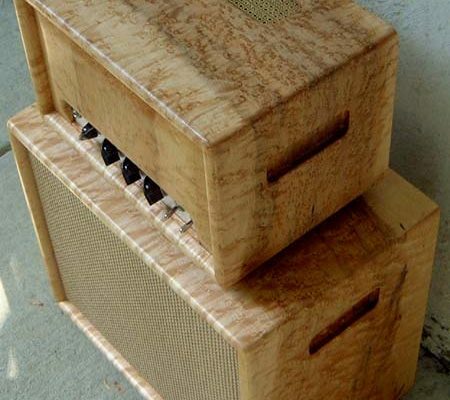 There is also a matching 1×12 cabinet available, again designed to deliver that acoustic Archtop sound. Are you looking for a versatile Blues/Rock amp? The Redbone, English, Plott, or Beagle will deliver a dynamic tonal range that will allow you to tune-in “your” sound. See the “How Much Power Do You Need?” section, to compare these models. Are you looking for a high gain/high power Rock ‘n Roll amp? If so, the Bloodhound is for you. This amp delivers that classic late 60’s to late 70’s sound, with gain and power to spare. Are you looking for a Bass or Steel guitar amp? The Basset was designed to deliver a big, warm, natural sound for Upright and Electric Bass. Are you playing primarily at home and playing with a band only once in a while? I would recommend a lower power, Class A amp like the Beagle or Plott Hound. With the lower-powered amps you can “turn them up” without having to deal with abusive volume levels. The Pure Class A circuit will deliver a rich, dynamic feel at all volume levels, eliminating the need to have it always turned up all the way. Are you playing at home, in the studio, and gigging regularly? Are you playing professionally at large venues? If you need a louder stage volume to be heard in the mix, the Redbone or Bloodhound will boldly deliver. The English is also a good choice, if your rig is mic’d or if you need a moderate stage volume level. Do you want a lot of clean headroom or are you a Jazz or Country player? The Redbone will deliver a wide range of sounds, with a lot of clean headroom. When turned up, it will give you that classic tube distortion. The Italian is a totally clean and warm powerhouse. It can handle any Jazz performance that may come your way. A 10 Watt, 2xEL84 based amp for studio, home, and small / moderate sized gigs. This amp has an extremely dynamic tonal range that covers Rock and Blues all the way to Country music. This amp was optimally designed to work with a 1×12 or 2×12 speaker cabinet with the Alnico Blue/”Bulldog” speaker. Utilizing the EL84s voicing this amp delivers that classic jangle and shimmer when clean and a high-end harmonic overdrive when distorted. A 10 Watt, 2x6V6 based amp for studio, home, and small / moderate sized gigs. This amp has an extremely dynamic tonal range that covers Rock and Blues all the way to Country music. This amp was optimally designed to work with a 1×12 or 2×12 speaker cabinet with the Alnico Blue/”Bulldog” or Celestion G12H30 speaker for a British sound or with a Jensen type speaker for an American sound. Utilizing the 6V6’s voicing, this amp delivers a rich midrange with a smooth top end and a creamy harmonic overdrive when turned up. A 20 Watt, 4xEL84 based amp for studio, home, and gigging. This amp has an extremely dynamic tonal range that covers Rock and Blues all the way to Country music. This amp was optimally designed to work with a 2×12 speaker cabinet with the Alnico Blue/”Bulldog” speaker or with a Celestion loaded 4×12 for a British sound. Utilizing the EL84’s voicing, this amp delivers that classic jangle and shimmer when clean and a high-end harmonic overdrive when distorted. A 55 Watt, 2×6550 based amp for studio and larger / outdoor gigging. This amp has an extremely dynamic tonal range that covers Rock and Blues all the way to Country music. This amp was optimally designed to work with a Celestion-loaded 4×12 for that classic late 60’s / early 70’s Rock sound. Utilizing the 6550’s voicing, this amp delivers smooth, articulate and bell-like clean tones and a harmonically rich, buttery-thick distortion. A 55 Watt, 2×6550 based amp based on an all octal preamp, for studio and larger / outdoor gigging. This amp has an extremely dynamic tonal range that covers Rock and Blues all the way to Country music. This amp was optimally designed to work with a Celestion loaded 4×12 for that classic late 60’s / early 70’s Rock sound. Utilizing the 6550’s voicing and the Octal preamp section, this amp delivers a big, bold, articulate and bell-like clean tone and an ultra-rich, buttery-thick distortion. A 55 Watt, 2×6550 based amp for studio and larger / outdoor gigging. This amp is a flat out Rock ‘n Roll amp. This amp was optimally designed to work with a Celestion loaded 4×12 for that late 70’s Hard Rock sound. Utilizing the 6550’s voicing, this amp delivers a tight focused clean tone and a harmonically rich overdriven distortion. A 60 Watt, 2×6550 based amp for home, studio, and gigging. This amp has an extremely dynamic tonal range that covers straight ahead Jazz to a Funk or Bluesy style. This amp was optimally designed to work with a 1×12 Alessandro / Cerwin Vega Speaker, to deliver an acoustic Archtop sound. Utilizing the 6550’s voicing, this amp delivers a smooth, warm and “woody” tone. A 20 Watt, 4x6V6 based amp for studio, home, and gigging. Think of a Plotthound meets an English. This amp has an extremely dynamic tonal range that covers Rock and Blues all the way to Country music. This amp was optimally designed to work with a 2×12 speaker cabinet with the Alnico Blue/”Bulldog” speaker or with a Jensen for classic Americana. Utilizing the 6V6’s voicing, this amp delivers a rich midrange with a smooth top end and creamy harmonic overdrive. The Black ‘n Tan can accept 2 x EL34, 6L6, or KT66. The preamp uses 2 x 6SL7. The Black ‘n Tan is able to deliver both the classic American and British tube amp tones. Big warm clean tones with a round, bell-like quality. The Alessandro Rhodesian is a 2xKT66-based power amp with 2x6SL7 (octal) based preamp. This amp sounds like a cross between a mid 60’s British tone and late 50’s American sound. As is the case with all Alessandro amplifiers, the hand-made cabinetry is available in a stunning array of woods, including oak, flame maple, cherry, mahogany, walnut and cocobolo, to name a few, with an optional, custom-made, Reunion Blues heavy-duty padded gig bag. Matching speaker cabinets in different configurations are also available.